FOR LANG Titles from KIDS FIRST! Description - Allons chanter! (Let's sing) Allons danser! (Let's dance) Apprenons le Francais! (Let's learn French) Get in the language-learning groove with this fun-filled collection of original tunes and beloved traditional favorites. Makes learning French as easy as un, deux, trois! KIDS FIRST!® Adult Jurors say - Allons Danser (Lets Dance) is a charming and inviting way for young children to learn French words and phrases through familiar children's songs. These twenty ditties for little kiddies will have the whole family dancing from 'Bonjour Les Amis' (Hello Friends) to 'Au Revoir' (Goodbye) and did I mention the highlight of 'Le Vieux MacDonald' (Old MacDonald)? He had a farm in France too, apparently. Renowned French artists Marie-Louise Desage and Didier Prossaird add a major touch of class to make this musical vintage an album for many a listen! Very musically engaging. Learning to speak French is a bit of a hard sell to kids but this makes it seem extra cool! Offers exposure to brilliant musical performances and another culture, always a good thing. Very upbeat instrumentation. 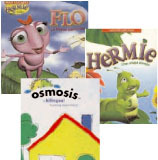 Promotes cultural awareness and introduces familiar children's songs in French. Hits the bulls-eye for its target audience of young children. Great production values across the board. Stellar! Love the vocals and the bouncy arrangements. Instrumentation is infectious. KIDS FIRST!® Kid Jurors say - Filled with songs for learning the French language, this CD is so fun and pleasant I found myself dancing as I listened to each and every song. The vocals and catchy songs stuck in my head even when I wasn't listening to the CD! Allons Danser! contains 20 short songs intended to teach children French. Song topics range from the classic Old MacDonald to parties for kids. The songs are sung by a woman and children, while the music is provided by a keyboard, percussion, trumpet, trombone and guitars. It comes with a lyric book containing the French lyrics and word-by-word English translations on the side - perfect for the young English-speaking child trying to learn French. Every song is different and very fun, but one of the most exciting to listen to was "Un Deux et Trois" which translates to "One, Two, and Three." This song is very happy and, just like the other songs, it has a catchy hook and refrain. Another standout song is "Les Petits Poissons" or "The Little Fish." This song is a little bit slower but still very whimsical and enjoyable. The vocals are provided by Marie-Louie Desage and her voice is very smooth and pleasant. She enunciates very clearly and it is very easy to follow along with her in the lyric book. There are child vocalists that come in at a couple parts in each song, providing more of a backbone of background vocals to Desage. The music accompaniment is very clean and does not overwhelm the French lyrics that Desage is singing to the children. One thing that sticks out in particular is the enjoyment I got out of this. I genuinely had a great time listening to each song and learning French along the way, so children will have a blast as well. The film meets the KIDS FIRST! criteria perfectly and is suitable for children from the ages of 4 to 12. Both boys and girls would enjoy the CD equally as long as they are keen on learning French. The CD earns a 5 out of 5 star rating and is extremely well made. Description - This lively CD is a fabulous fusion of world music styles -- including cumbia, calypso, salsa, and merengue -- that teach kids Spanish. Get ready to be immersed in irresistible rhythms and pulse-pounding beats, and get ready to shout, "�Sabor! KIDS FIRST!® Adult Jurors say - �Sabor! - Spanish Learning Songs is a refreshing and fun way to learn Spanish words and phrases and dance and sing at the same time! You're a newbie? Do not fear, the helpful liner notes offer English translations to the all-Spanish set of traditional and original rousing tunes. Singer-songwriter Jorge Anaya and keyboardist Didier Prossaird keep this fast-paced party moving along with a splendid variety of rhythms and styles - cumbia, salsa and merengue to name a few - will have you dancing in the streets and shouting, �Sabor! Wonderfully produced, very authentic. The style is right on the money, the structure true to the source and the continuity from song to song is well done. The quality of the source material and the professionalism of the performers shines through and is perfect for young audiences. It gives you the idea that learning Spanish can be and should be fun, not work. It invites audience participation. I see this as a joyous musical exclamation of a fun introduction to our Spanish-speaking neighbors. Reviewed by John Wood, KIDS FIRST! Music Critic. 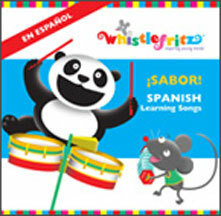 KIDS FIRST!® Kid Jurors say - This CD is good for kids that already know a little Spanish. The fast pace of the songs makes them fun and easy to learn a few new words, especially when refer to the booklet. Without the booklet, the songs are still fun but you don't necessarily learn any new words. The upbeat songs are fun to dance along with and are very happy sounding. A favorite of the kids was Old MacDonald. KIDFLIX GLOBAL Click to purchase directly from the producer This title has online video! Description - While rummaging in her grandmother's attic on New Year's eve, ten year old Stella steps into an antique wardrobe to find she has traveled 100 years back in time. She meets Clementine, her own great grandmother, and her younger brother, Gus. The three bond immediately, and Stella learns that their family is in serious financial difficulty and could lose their home. Family rumor of a hidden treasure lead the children on a perilous quest in search of the Star of the Orient, the perfect solution to their family's challenges. In German with English subtitles. KIDS FIRST!® Adult Jurors say - This is a very entertaining film about a young girl who travels back 100 years and meets her own grandmother as a young. She helps her find a treasure to save the family house. It shows how important it is to not give up, to believe in yourself and to conquer your fears. It also shows that this can all be accomplished with the help of friends and teamwork. This is a wonderful adventure and a good family film. The only unappealing this is the subtitles which go by pretty fast. The story has a treasure hunt quality to it that is very entertaining. It flows quite well and ends with a happy conclusion. The vocabulary is a bit different because it is in German. There was one phrase, that might be offensive to some. It does portray positive social models - true friendship and teamwork. The costumes and sets are appropriate to the time period. Aside from its entertainment values, it also addresses the concepts of facing your fears, not giving up and true friendship. 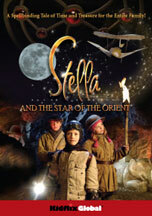 KIDS FIRST!® Kid Jurors say - Stella And Star of the Orient, is a wonderful film. What makes it wonderful, and what I really like about it, is the time frit takes place in. This movie mostly takes place in the early 1900s; the early 1900s is my favorite time periods. When you watch this movie, you'll feel like you're in the early 1900s because the way the scenes look and how to actors are dressed. The movie is about a girl name Stella, who finds a time machine at her grandmother's house. She accidentally travels back in time one hundred years and meets her great grandmother as a little girl. Her great grandmother's family is about to lose their house, and it's up to Stella and her new friends to save the house. The main characters in this movie are Stella (Kaura Berschuck), Clementine (Hanna Schwamborn) and Gustav (Julius R�mer). Some of the side characters are Kleinheinz (Axel Prahl) and Dr. Lodeus (Hans Martin Stier). The way the actors portray the characters is exactly how I imagine these character to behave. This is actually a foreign film from Germany. I have never seen a German film before and after seeing this film, I want to research German film-making more. My favorite part of this movie would be when Clementine's dad tells her that girls clean the house, take care of the kids and don't study. But Stella tells him girls can study too. Something that stuck out to me, after I finished the movie is the set design and the costumes. That's because (if you couldn't tell) I love this time period. The message in the film is to take risk and have an adventure. Description - When the summer course in outdoor climbing is cancelled, twelve year old Kim decides that she will solo climb "The East Wall" - as her late father did when he was twelve. Kim has a fall, is badly injured and wakes up trapped in a shack with a mother wolf and her cub who care for her until she is well. Then, realizing that the wolves are being chased by hunters, Kim sides with her protectors and is forced into a heated battle between animal and man. In Norwegian with English subtitles. Description - In medieval Denmark, Young Prince Valdemar longs to fight alongside his Father, but instead, the king sends him to safety in a remote monastery under the care of Bishop Eskil. Once there, Valdemar befriends the kitchen boy, Aske, and together they discover that the Bishop Eskil is secretly leading a rebellion against the king. 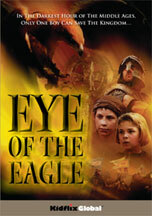 In order to save the king, the two friends must escape the evil bishop and his mercenary, One Eye, who can see through the eyes of his pet eagle. In Danish with English subtitles. KIDS FIRST!® Adult Jurors say - This is a beautifully filmed action/adventure movie probably most appealing to young boys. The young heroes get in and out of many dangerous situations and are quite often clever in the way they solve problems. You should be aware that it is subtitled which may be a deterrent for some. And, there is also profanity and some violence. It has a strong, historical storyline that is entertaining as well as educational. The story appears to depict the medieval times in which it takes place. Children who enjoy books of the genre of Robin Hood or King Arthur would find this appealing. It is the story of a young Danish prince who is sent off to live at the castle of an evil bishop while his father, the king, is off fighting wars. From the outset, the boy is locked in a room to do nothing but study what he is told. Of course, he escapes and thus begins his many adventurers to outwit the bishop and his men who are plotting against the king. Her survives many dangerous situations with the help of a young servant boy and they ultimately triumph and get back together with the King. There is also a back story of an eagle who appears at various points in the film and adds to the magical tone. KIDS FIRST!® Kid Jurors say - This film is in Swedish with English sub-titles. The plot is about a boy's journey from home and how he becomes a hero by exposing bad forces at work against the throne of his King father. The plot is simple, the events are not very suspenseful or exciting and the emotions expressed by the actors are not that impressive. The feeling after watching this is I wasn't too moved or too entertained. It is what I would call a movie you might watch if you had nothing else to do. I really wanted to be excited for the main character but didn't find him that interesting. The bad guys aren't all that scary and the situations they deal with are not very complex or intriguing. Sometimes the sub-titles are difficult to read. I think younger kids might find this more engaging. You should be aware there are some curse words but they are spoken in Swedish. Still, they are written in English. They seem pretty unnecessary in the film. The sound effects are a bit cheesy. I liked the scenery, probably because I saw parts of Sweden and found that interesting. I enjoyed hearing the Swedish words. It was enjoyable being introduced to a new language and accent. Some words seemed familiar such as "nigh" for "no." My favorite part is when the main character is reunited with his father. Because I am a boy, I like the idea of the father being proud of his son and seeing him recognized as being his father's hero. I would rate this 2 our of 5 stars and recommend it for kids ages 8 to 10. Reviewed by Tyler M, age 14. Description - Twelve-year-old Emil comes to Berlin to spend the holidays with friends, while his father is at home in the hospital. 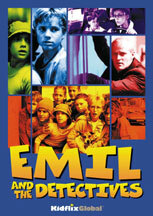 On his way, he meets the gangster Grundeis who steals all of Emil's money. But together with his new pal, Pony, and her gang of street-wise friends, Emil vows to catch the thief and deliver him to the police. In German with English subtitles. Description - This Spanish language sing-along music video features all kinds of trucks. Includes construction, logging, fire trucks, tractors, monster trucks, garbage, snow-plows, dump trucks, steam shovels and lots of exciting action and sounds. Award-winning music by James Coffey. KIDS FIRST!® Adult Jurors say - Educational, positive and interesting. Appeals to kids specifically interested in trucks. I like that the film is in Spanish and yet, any kid who likes trucks can enjoy it without necessarily understanding the lyrics. Upbeat music with pictures of real tractors and trucks. Though slightly grainy, the cinematography is excellent. Great informational video showing trucks from John Deere to Caterpillar at work, race cars racing, trucks moving snow and slush to clean streets, mail trucks delivering mail and sanitation trucks picking up garbage. Really captures trucks in action and at work. KIDS FIRST!® Kid Jurors say - Children who are "into" trucks love this, others are less interested. Some of the kids sang about the trucks. "Yay! Trucks!" Description - Introduces the vocabulary with fun-filled activities that children love. Sing and Learn Spanish is engaging and effective whether teaching Spanish as a second language, or preserving a native language at home. They make great Spanish preschool songs. Excellent for use in after school programs. KIDS FIRST!® Adult Jurors say - Very lively, upbeat music, colorful. They show a word in Spanish and then sing a song to reinforce the meaning of the word. Fun way to learn a few words in Spanish. Makes it memorable. The Spanish words are those that kids will be familiar with. It is very respectful of the Spanish speaking culture and shows happy kids and images. It's difficult to catch or remember all the words or songs but with repeated viewings, children would definitely be able to expand their vocabulary. KIDS FIRST!® Kid Jurors say - Kids liked it. "It was fun. I liked the kids and the songs were silly." "I would want to learn the songs better." "My friends would like this if they wanted to learn Spanish or if they already spoke Spanish." "I like to see animals and different places." "The songs were fun and Dad made me laugh trying to sing along." Description - Award-winning BookBox makes learning to read fun. Conceived by child literacy expert Dr. Brij Kothari and his team, at Stanford University, BookBox Stories entertain children and improve their reading skills at the same time. 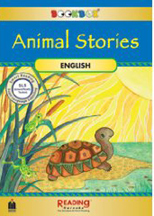 Using scientifically tested SLS (same language subtitling), children will improve their listening comprehension, reading skills and foreign language skills by watching, listening and reading aloud these enchanting animal stories. There are three ways to use this DVD. You can watch the story as it is told and read the text which is synchronized, listen to the story without text, read the story out loud as the program plays with music and text but without the recorded narration. KIDS FIRST! Endorsed and Dr. Toy Top 10 Audio/Video Awards. Three stories featured: 1. Turtle's Flute Turtle is a gifted flutist. When the Turtle played her flute, everyone danced. One day, she is trapped by a greedy man. How will she escape now? 2. Zippy the Zebra Zippy is bugged by a hide full of fleas. No amount of tail swishing or tree trunk scratching would give him any relief. Finally a pair of birds help him out by making a meal of his unwelcome guests. 3. The Four Friends Animal friends work together to outwit a hunter and protect each other! Animal friends are based on an ancient Indian Fables. KIDS FIRST!® Adult Jurors say - Encourages children to read along as they watch the story. Each story had an interesting moral lesson that encouraged friendship, working together and showed positive outcomes. These stories come from different countries and are done in a literary style, showing pictures like drawings in a book. Very easy to follow along with the words for early readers and fun to watch for pre-readers. Though the stories are paced slowly, they are complex enough to make you think - for instance, why would a "water seed" make water? These classic stories will give your child a glimpse into different cultures. KIDS FIRST!® Kid Jurors say - Very enjoyable. "It was fun to follow the words at the bottom." While some kids were intrigued by the stories, others craved a more action-packed video. "The movie made me want to read along." "I like how the animals helped their friends. It makes me think about helping my friends." Two 4-year-olds expressed an interest afterwards in wanting to read "like the lady telling the story." "I liked the characters because they were funny." The movie seemed to have a calming affect. Kids were curious to find out what would happen as the stories progressed. "It was funny how they planted a piece of ice and thought it was a water seed, and when they dug a hole to look for it and woke up the next morning to find a well full of water! It was also funny when the elephant ate all the ice cream and kicked the coconut." Some of the younger readers found the words moved too quickly to follow. 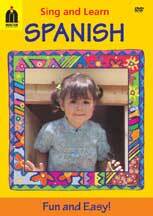 Description - Take a class with Ms Blanca as she motivates children to learn Spanish and English. Includes songs, illustrations, and puppet shows about colors, numbers, manners, party words and more; all finalizing in a pi�ata party! 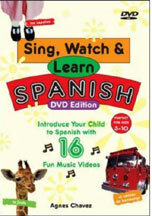 KIDS FIRST!® Adult Jurors say - This video is a wonderful way for anyone to introduce the Spanish language to children. It could be used in a school environment or home. Ms. Blanca is clearly a warm and gifted teacher and any child watching this will benefit from her presentation. The Spanish words explored in the video are perfect for young audiences and are presented in a repetitive yet joyous manner such that children are encouraged to genuinely say and learn the words. It's very colorful and very "real" - not a highly produced program. Instead, it's to the point and it works. KIDS FIRST!® Kid Jurors say - Kids enjoyed it, especially the music and the puppets. One said, "I want to know more Spanish words." All of the children really liked Ms. Blanca. One girl in particular kept wanting to only see her. She kept asking, "Where's the girl" whenever Ms. Blanca wasn't in the frame. They loved the words for the items often seen at a party. In fact, when the word "popcorn" came up, one of the children wanted popcorn so much that the teacher stopped and made popcorn before moving on. Another little girl, after watching it twice asked for a rojo popsicle because, as she said, "rojo in Spanish means red." They particularly enjoyed learning the Spanish word for "jump." Afterwards, they all got up and jumped around. They enjoyed repeating the words after Ms. Blanca, although some repeated in English not Spanish. The pi�ata was another hit with them.. Description - Uses entertaining immersion methods to introduce children to words and phrases in French for conversing about mealtime. 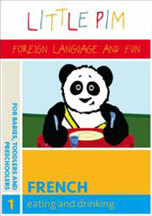 KIDS FIRST!® Adult Jurors say - Good kid-friendly introduction to another language. Good style and presentation. Definitely suitable for preschoolers. Flows nicely, with a pattern that makes sense to the kids: breakfast, lunch, dinner, each with a short review. Gives parents a way to introduce kids to another culture or language. Obviously, kids aren't going to learn everything in one sitting so repeat viewing would be required if you really wanted to make the lessons stick. Good production quality. Learning about people from different backgrounds can only be a plus for kids as it helps them understand how everyone is different. KIDS FIRST!® Kid Jurors say - Mixed reactions from kids. The 3-5's really did parrot their way through this and come out without any words they remembered. The good news is that most loved watching it. The animated parts were just as appealing as the real life scenes and something about the bear got them talking. One group who had just watched a show with a Spanish speaking host responded much more positively to this DVD that the other. Description - Using music from around the Spanish-speaking world as the soundtrack, these sixteen music videos teach your child a new language. They can sing along to the Latin rhythms, read the Spanish sub-titles and full lyrics in English and Spanish in the accompanying teaching guide. It covers animals, food, home, verb, the body, clothes, opposites, places, family, school, nature, transportation, professions, and things to do. KIDS FIRST!® Adult Jurors say - Does a solid job of introducing kids to a new language. The themes are very suitable and the rhythmic melodies engaging. The pace is appropriate for five and up. The program is presented entirely in Spanish with upbeat music and compelling images representing a Latin environment. Spanish sub-titles are clearly presented though obviously, only children old enough to read can benefit from those. KIDS FIRST!® Kid Jurors say - Mixed reviews. Most kids enjoyed it "because I got to learn more Spanish." "I learned about different things in Spanish." "I saw different people. Everyone looked happy and they were nice to each other." "I loved the music. It made me want to dance." This title is available for purchase from SUBE, INC. 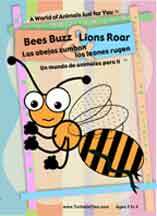 Description - A bilingual, English and Spanish, program for preschoolers about animals. Features a selection of animated shorts, text stories, and the alphabet. KIDS FIRST!® Adult Jurors say - Entertaining and engaging. Allows the parent to interact with the child without missing out on the purpose of the video. Exposes children to another language. The menu is easy to navigate and offers many choices. The poems and stories are short and entertaining. You can chose to watch this in Spanish or English. Narration is very clear. There is lots of repetition and many recognizable animals as well as new ones. Images are simple yet colorful. KIDS FIRST!® Kid Jurors say - Youngest kids enjoyed it best. "I like making animal noises and acting silly." "I really liked the monkey." "I love doing the bunny hop. The ant doing the bunny hop was funny." "It had a dolphin, giraffe, and a koala." They kids interacted, constantly talking about what they saw onscreen. Older children read along to the words in the story. MOMMY TEACH ME SPANISH! VOL. 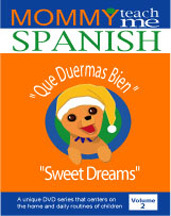 2 "QUE DUERMAS BIEN - SWEET DREAMS"
Series: MOMMY TEACH ME SPANISH! Description - Centers on the home and daily routines of babies and young children. It is designed for English speaking families who are looking for a fun and easy way to give their children a basic introduction to Spanish that relates to their everyday lives. Characters include Fuerte, the adorable Chihuahua and his amigo Fuego, a chili pepper. Included are popular nursery rhymes in Spanish, numbers from one to 20, items in the bedroom, toys, and simple phrases and commands. KIDS FIRST!® Adult Jurors say - Cute on-screen kids, puppets, and familiar songs. Words are appropriate for target audience. Clear images and sound. Some images of puppets and on-screen kids appear fuzzy and pixelated. Colors are bright with good contrast. If there is one fault, it is overly simplified and very one dimensional. One juror commented that her austic child absolutely loves it. KIDS FIRST!® Kid Jurors say - Enjoyable with limits. "Yes, I liked learning another language." The toddlers liked the music and animation best. The kids tried to say the Spanish words and sing along. Some groups were more receptive than others. Description - Teaches basic Mandarin Chinese. Children will have fun visiting a market and farm in China and learning about fruits, animals, body parts, action verbs and more. KIDS FIRST!® Adult Jurors say - Appealing. Gentle and interesting. Many approaches shown in segmented clips, with game-like "quizzes." Pleasing mix of gender, race and culture. Not for bilingual kids just learning English, but "a decent way for even adults to learn basic Chinese." KIDS FIRST!® Kid Jurors say - Liked the pace, songs and seeing interracial children. Participated in the games and interacted with the body parts segment. Attempted some words. "I liked the yummy food and the girl's dress." "They sang songs we know in Chinese." "It's just good." Description - Introduces Mandarin Chinese to children in an engaging and interactive way. Kids will spend the day with children at a Chinese kindergarten, while they learn greetings, numbers, counting, colors, songs and more. KIDS FIRST!® Adult Jurors say - Polished presentation holds interest with bright colors, enthusiastic children and animated effects. Very good selection of relevant vocabulary. Repetitive format appropriate for targeted age. "Introduces Chinese in a brief, understandable way." KIDS FIRST!® Kid Jurors say - Older kids enjoyed it and asked to see it again; youngest viewers lost interest. "I like the kids. They smiled and helped us say the words." "It's fun to learn. We could memorize more." "I like singing to the music." "We liked the numbers." Description - Teaches early language skills to young children, introducing different sounds, syntax and sentence structures. KIDS FIRST!® Adult Jurors say - Well produced, flows easily. Presents Spanish in a fun and interesting way. Most effective viewed with an adult. Contains a lot of information but doesn't allow much time for assimilation and answering the questions. KIDS FIRST!® Kid Jurors say - Mixed reviews. Some kids gravitated toward the show and were motivated and attentive. Others lost interest quickly. "We can practice saying words in Spanish." "I want to learn Spanish so I can talk to my Spanish-speaking friends." Description - Includes: "Musical Max," a story about practicing music, "Monty," who won't give his friends a ride to school, "Whistle for Willie," about a boy who learns to call his dog, and "Panama" the tale of two friends in search of their dreams. KIDS FIRST!® Adult Jurors say - Appealing, good production values, true to original stories. Great supplement to a literature program. Discusses social values and achieving happiness in life. A great Spanish language program for non-native speakers. KIDS FIRST!® Kid Jurors say - Appreciated having problems to solve and fantasies to live. Children were encouraged to make predictions and comment on events in the stories. "Really good stories - the kind we like to watch." "At last! Stories I love - in Spanish!" Description - Video adaptations, in Spanish, of four classic stories: "The Little Red Hen," "Stone Soup," "Why Mosquitoes Buzz in People's Ears," and "Charlie Needs a Cloak." Includes a curriculum guide for enhancing early language and literacy skills. KIDS FIRST!® Adult Jurors say - Wonderful variety of styles. True to the original stories. Well paced. Glimpses into different cultures, lifestyles and experiences. Emphasizes cooperation and creativity. Enhances Spanish language fluency. KIDS FIRST!® Kid Jurors say - Liked the vibrant colors but could only understand a little of the Spanish. "I liked the mosquito story. I just read it in English in school." "It wasn't like science of math, but just good stories!" "Shows us that you reap what you sow." Description - In Spanish. Stories: "Rosie's Walk" (fox stalks an unsuspecting hen), "The Caterpillar and the Polliwog" (about springtime), "Make Way for Ducklings" (the story of Mr. and Mrs. Mallard), and "The Story About Ping" (a lonely duck is befriended by a boy). KIDS FIRST!® Adult Jurors say - Faithful adaptations of classics and some newer tales. Excellent narration, good pace, sweet and appealing. Animation is done in iconographic style. Inaccurately stereotypes Chinese people. Addresses being on time, safety of home and family. KIDS FIRST!® Kid Jurors say - Imaginations were captured. "I love it in Spanish like we speak at home." "I was scared for the Ping duck but I liked it all." "This is a great story time." "Let's get these books. I know they are at the library." Each child had a favorite story. Description - Four stories in Spanish. The first shows Curious George's adventures in a circus. Next, "Millions of Cats," where a man looking for a cat discovers trillions of cats. "Noisy Nora" makes her presence known at in her house where everyone is too busy. KIDS FIRST!® Adult Jurors say - Illustrations in "El Dia Nevado" are gorgeous, creative, colorful and cozy. "Millions of Cats" is not as appealing. The Spanish vocabulary is a plus. "Kids need stories like these. George gets into trouble but always saves the day at the end." KIDS FIRST!® Kid Jurors say - Some were disappointed that the stories were not fully animated. "My friends might want the pictures to move like cartoons." Children liked "Curious George" best. One group of non-Spanish speaking kids found it difficult to follow in Spanish. Description - A user-friendly program designed for anyone who wants to learn American Sign Language. Lessons focus on common topics applicable to daily life. Viewers are entertained by the Bravo family and guided by deaf instructor, Billy Seago. KIDS FIRST!® Adult Jurors say - Uses effective teaching strategies - signs are given in advance, then demonstrated in a realistic environment. Production quality is quite good. Instruction offers a useful resource for any ASL class. Repetition is suitable for beginners. KIDS FIRST!® Kid Jurors say - Kids tried to figure out the parts that were only given in sign language, and enjoyed understanding new communication skills. They were fascinated watching family members speak in ASL. Kids wishing to learn sign language will enjoy this most. Description - What, you don't speak French? Moustache teaches how to speak French while introducing his friends, singing songs and visiting a magic show. KIDS FIRST!® Adult Jurors say - Very slow-paced. Clever, innovative approach to teaching French. The lessons are short, challenging and require concentration. The cats were great. "Good not great, not all-star, pretty static. KIDS FIRST!® Kid Jurors say - Kids had trouble reading the French words on-screen. Using songs makes it much easier to learn another language than using straight vocabulary. Introduces kids to the intricacies of learning another language.